40 Years of leadership in service to Shipping Lines for Marine Refrigerated containers. 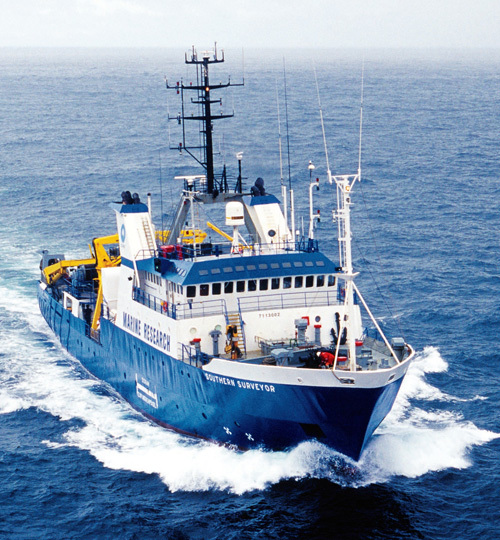 Dolphin Marine Enterprises Pvt Ltd, the pioneer of marine refrigeration units, founded, created and incorporated in India in the year 1977 by Lt Cdr Kashmira Singh NM IN ( Retd ) a retired Indian Navy officer and awarded the Nao Sena Medal during active service in the Indian Navy. Dolphin Marine Enterprises Pvt Ltd is the first company to start the PTI, maintenance, repairs and servicing of reefer containers in India. Dolphin Marine is presently engaged in Empty container depot activity, repairs and maintenance of all types of Marine Freight containers which includes Pre Trip Inspection, Reefer machinery repairs, Structural body repair as per IICL and warranty repairs. We have a fully equipped mobile pickup van to attend malfunction reefer containers at various shipper premises. Our reefer maintenance staff is qualified and trained in the field of refrigeration and have attended certified courses conducted by the reefer unit manufacturers. 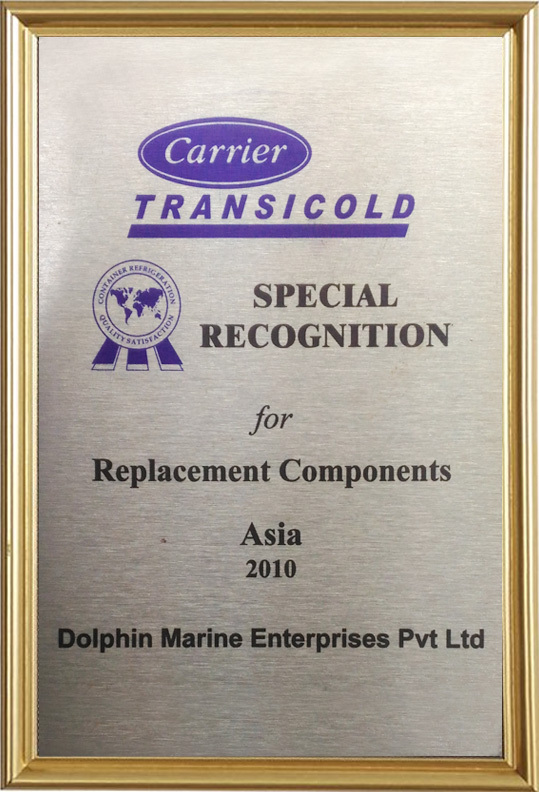 Dolphin Marine Enterprises Pvt Ltd was awarded the Special Recognition for Customer Satisfaction Asia Pacific Region for the year 2010 at the Carrier Transicold Dealer Conference held in Hanoi, Vietnam in 2010. 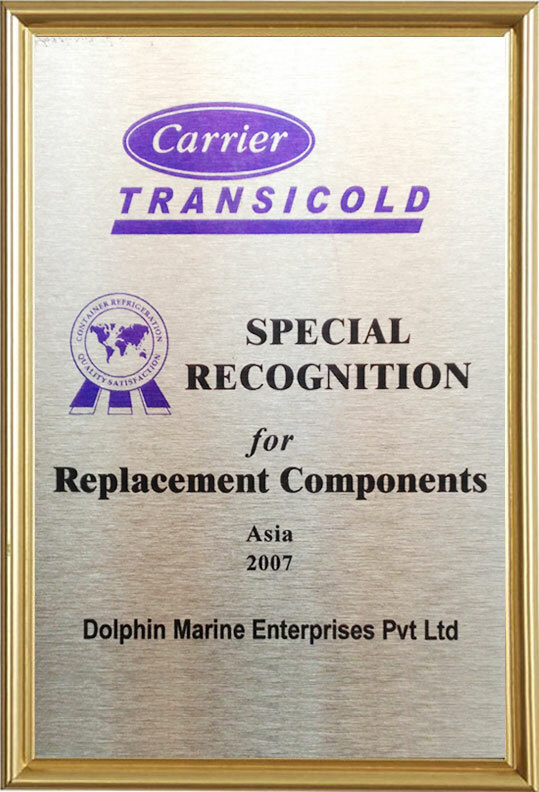 Dolphin Marine Enterprises Pvt Ltd was awarded the Special Recognition for Customer Satisfaction Asia Pacific Region for the year 2007 at the Carrier Transicold Dealer Conference held in China in 2007.Transicold Dealer Conference held in Phuket, Thailand in 2004. 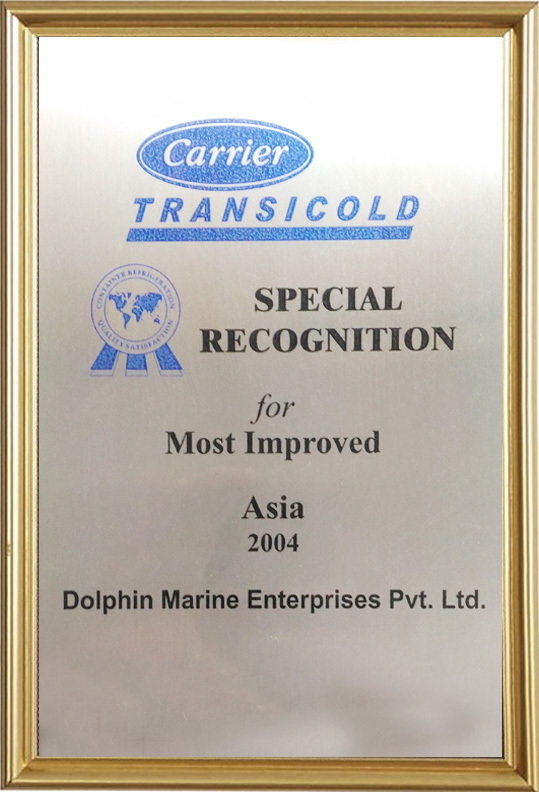 Dolphin Marine Enterprises Pvt Ltd was awarded the Special RecognDolphin Marine Enterprises Pvt Ltd was also awarded the Special Recognition for the Most Improved Service Centre for the year 2004 at the Carrier Transicold dealer Conference held at Chengdu, China in 2005. 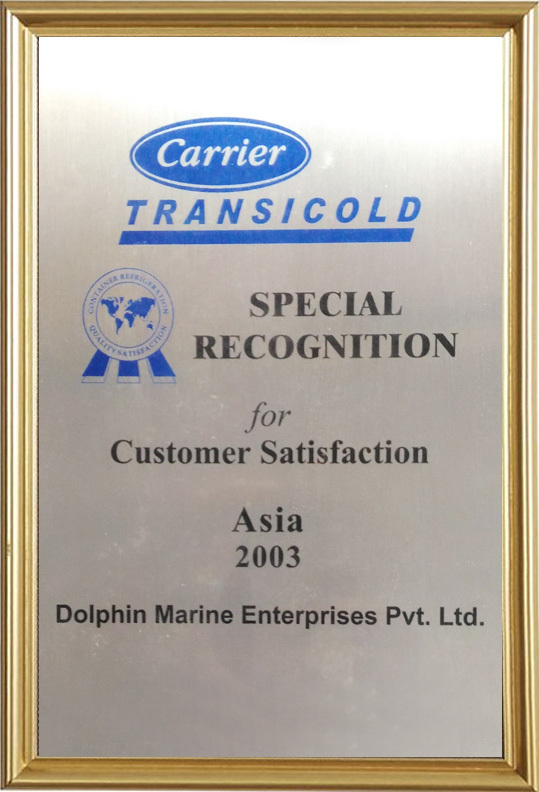 Dolphin Marine Enterprises Pvt Ltd was awarded the Special Recognition for Customer Satisfaction Asia Pacific Region for the year 2003 at the Carrier Transicold Dealer Conference held in Phuket, Thailand in 2004. To be pioneer in Reefer container depot management including repairs by offering High quality interfaces between customers at all levels and providing seamless service. To work well with persuasive qualities. To protect quality of environment. The reefer body survey and repairs includes a world class infrastructure like covered shed, foaming machine, MIG welding machine and carry out repairs not only on the container box but also on the reefer unit frame as per IICL standards. 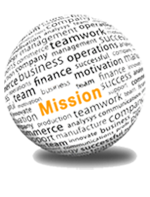 The work has been approved by various Shipping Line principals. 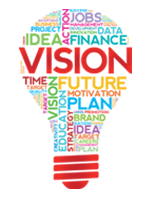 We are in the process of expanding our business opportunities and satisfy our customers and other business supporters to provide seamless service with your support. We will take care of all reefer related operations like Empty depot operations, PTI, Reporting in Shipping line specific format, Machinery and structure repairs, allotment of containers in FIFO basis, attend malfunction containers at shipper premises, 24 hours on call, monitoring of export / Import reefer containers in the port, connecting containers on board etc. We are the Warranty Repair and Spare Dealer for Daikin, Thermo King and Star Cool Marine Reefer Container Machinery. All Right Reserved By Dolphin Marine Enterprises Pvt. Ltd.